During World War II, the 505th Parachute Infantry Regiment participated in seven major campaigns and four regimental airborne assaults. 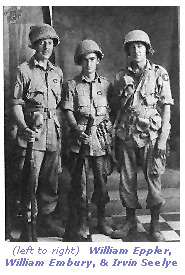 On 9 July 1943, just over a year after it's activation the 505th made the first regimental size combat parachute attack as part of Operation Husky l. Under the capable leadership of Colonel James M. "Slim Jim" Gavin (above left) the 505th was organized into a Regimental Combat Team which included the 3rd Battalion of the 504th. As a staff officer in Airborne Command under General Lee, Colonel Gavin wrote "Instructional Pamphlet for Airborne Operations". These theories and observations would now be put to the test. Their objective was to parachute behind enemy lines into an egg-shaped area around Gela, Sicily. They would then close off roads leading to beaches and secure the drop zone for further use. Especially important near the DZ was enemy-held Objective Y - a series of 16 concrete "pillboxes" from which German gunners controlled movement on nearby roads. However, Mother Nature did not cooperate. On July 9th Colonel Gavin was informed that wind velocity in the landing area was 35 miles per hour but the invasion was underway and there was no turning back. It was under these harrowing conditions that the 505th had its first trial-by-fire. Only 15% of the combat team had been delivered to the correct DZ. Nevertheless, small groups of lost Paratroopers cut every phone line that they found which devastated the communications of the Axis forces. Ambushes were conducted and even Objective Y, the deadly pillboxes, (picture right) were secured. By continuing to fight in small groups the 505th led the Germans and Italians to overestimate the number of airborne invaders thus impeding any meaningful counterattacks. The German Herman Goering Panzer Division was another matter. Even though outmanned and outgunned, the 505th used raw courage and fighting spirit to block the steel behemoths of this Division from advancing toward the Allied landings on the beachhead. With Sicily secure, the Allies continued attack on the Axis powers with landings on the Italian mainland. A landing on mainland Italy took place in the early morning of 12 September 1943 at Salerno under General Mark Clark. Within 72 hours German Field Marshal Kesselring was poised to drive the Allies back into the sea. This set the stage for the 505th's second combat jump. On the night of 14 September 1943, Jim Gavin's 505th Parachute Infantry totaling roughly 2100 combat hardened paratroopers dropped onto the tenuous Salerno beachhead. It was an encore performance of the previous night's precise parachute jump by the 504th and no less spectacular. Within 24 hours these two units of the 82nd Airborne had jumped on short notice and shored up the faltering Salerno beachhead. Two weeks later on 29 September the 505th had probed into the outskirts of Naples thereby capturing the first major European city for the Allies. On 9 December 1943 Colonel Gavin was promoted to Brigadier General and assumed the duties of the Assistant Division Commander of the 82nd Airborne while Lt Col Herbert Batchellor assumed command of the 505th. During the early months of 1944, the Division was moved to England as the allies were preparing for the assault on Western Europe. The regiment again changed commanders. Lt Col William Ekman assumed command on 22 March 1944 and would lead the 505th through the remainder of the war. The largest combined military operation in history,"D-Day", was to be spearheaded by the 82d and 101st Airborne Divisions. Visibility was hampered by poor weather conditions as the C-47's crossed the English Channel during the first hours of the 6th of June 1944. When the troop carriers finally did made landfall on the Cherbourg Peninsula they came under heavy German flak scattering many of the troop carrier flights. It was 0300 hours on 6 June 1944, when the 505th were given the green light to jump. Some Pathfinders were able to signal their dropzones. However, many of the troop carriers missed their dropzones and the All-Americans of the 505th began landing across a large swath of the countryside around Normandy. Nevertheless, the 505th PIR was one of the first airborne units to hit the ground and despite the subsequent confusion surrounding the landing, were able to use it to their advantage mustering enough troops under the command of the 2nd Battalion Commander, Lt. Col. Benjamin Vandervoort to liberate the first town in France, - St. Mere-Eglise. The paratroopers jumped prior to the actual start of the invasion "H-Hour". Because of the tradition of being the first into the fight, the 505th Regimental motto is "H-MINUS". For their performance in the invasions the 505th was awarded the Presidential unit citation, the unit equivalent of the Medal of Honor awarded to individual soldiers. In the words of author Clay Blair, the paratroopers emerged from Normandy with the reputation of being a pack of jackals; the toughest, most resourceful and bloodthirsty in Europe. On 9 September 1944 Field-Marshal Montgomery proposed a plan, called Operation Market Garden, to secure a bridgegehead across the Rhine. The operation called for a combined armor and airborne assault to seize and hold key bridges and roads deep behind German lines in Holland. The airborne phase of the operation consisted of capturing five bridges ahead of the armored force. On 17 September 1944, as part of Operation Market Garden, the 505th made its fourth jump at Groesbeck, Holland, the largest airborne assault in history. During that fierce combat, two lightly armed platoons, at most 80 men, were surrounded by an entire German Infantry Battalion supported by tanks. The paratroopers fought back three savage German assaults and held their ground until relieved. The 505th received a second Presidential unit citation. Suddenly, on December 16, 1944, the Germans launched a surprise offensive through the Ardennes Forest which caught the Allies completely by surprise. Two days later the 82nd joined the fighting and quickly blunted General Von Runstedt's northern penetration of the American lines above Bastogne. Meanwhile, on the morning of 19 December the 501st PIR of the 101st Airborne Division was digging in at Bastogne, as the Germans quickly infiltrated and cut off the road between the two elements and the "Battle of the Bulge" offensive flowed around the two airborne units. Despite a lack of cold weather equipment once again airborne spirit, courage, and hard-nosed determination won the day as the 505th withstood the bleak winter and stopped the fanatic German attacks at Ste Vith and the Salm River. For its valor in the seven major campaigns of the European Theatre of Operations, the 505th was awarded two Distinguished Unit Citations and three Foreign decorations: the French Forragere, Netherlands Military Order of William, and Belgium Forragere. The war offically ended in Europe on 8 May 1945 and the 82nd Airborne Division was called upon to serve as the occupation force in the American Sector of Berlin. Here the 82nd Airborne Division earned the name, "America's Guard of Honor," as a fitting end to hostilities in which the "All-Americans" had chased the German Army some 14,000 miles across the European Theater. D Company 505th PIR - Post-War photo of Company D, 505th PIR at Fort Bragg on 28 April 1948. E Company 505th PIR - Photo of E Company, 505th PIR troopers preparing for the D-Day invasion.